Opportunity for Accredited investors, Clover Creek is a Large scale Cannabis Cultivation and Extraction Production facility. Located in Nevada, 2 hours north of Las Vegas. 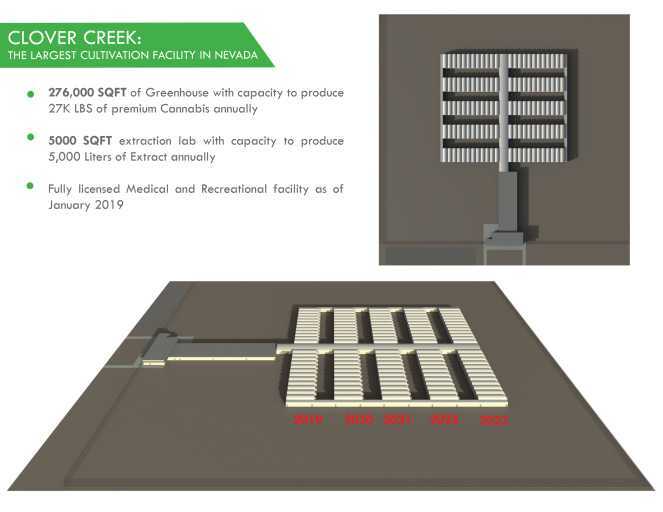 Our Cultivation team has built, managed and successfully cultivated over 100,000 sqft of Green house production in CA - Our Nevada operations team has a cumulative 50 years of cultivation experience in specialised Cannbis production. Our business portfolio consists of International Lighting & nutrient companies. Cultivation and Production (Extraction) Licenses already obtained in state.